Hannemann's best finish was a 2000 AVP second with Adam Jewell at Belmar, N.J. Hannemann earned $8,035 on the 2001 AVP Tour with a third at Huntington Beach with Jewell. He and his brother (Albert) attempted to qualify for the Sydney 2000 Olympic Games for American Samoa. Hannemann was one of eight players to earn tour exemption for the 1994 season via the 1993 AVP Qualifying Series. 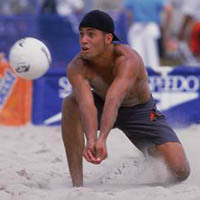 The Hannemanns have another brother (Chris), who has also played pro beach volleyball.